These early duster coats are sought after by early motorcar enthusiasts as they are terrific to wear at the next antique car meet! Especially if you happen to have an early Model T Ford! This Magnificent Hand spun, hand woven HEMP Duster is beautifully made and is trimmed with hand applied battenburg lace details across the front and back yoke and at the cuffs. 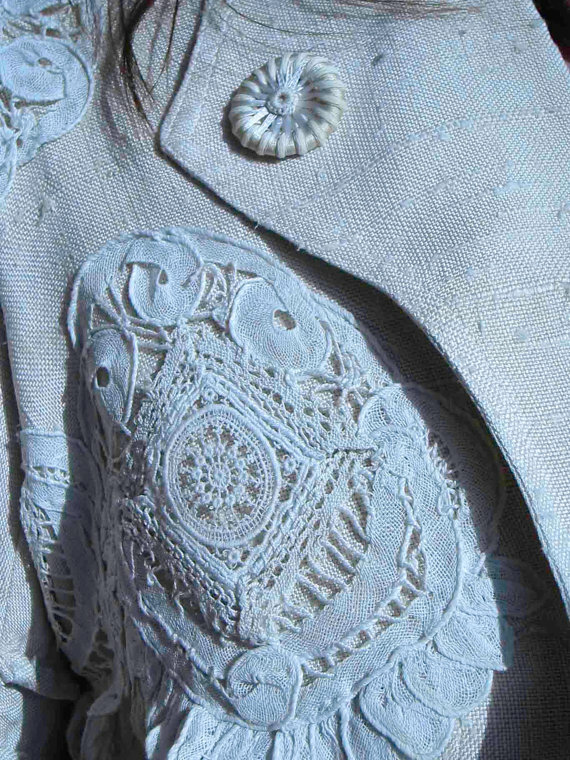 If it's true that you could tell the status and wealth of someone by the number of buttons on their clothing this elaborately embellished Motor Coat must have belonged to the most prominent woman in town. 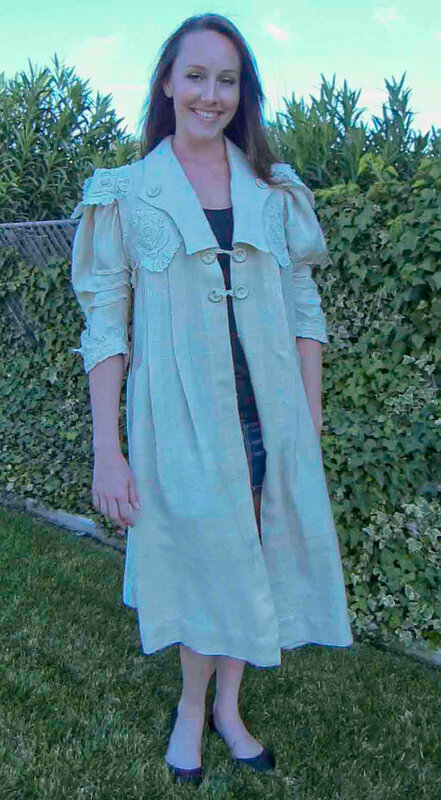 This antique Duster is embellished with 6 11/2" handmade, ribbon wrapped buttons on the front and 12!!!!!! pea sized ribbon wrapped buttons on each cuff. This vintage hemp motor coat duster is c. 1906 to 1910 when epaulets became all the rage. It has generous 1" pleats across the front and back for ease of movement. Measures: up to 18 1/2" bust, 19" across the back, 47" from back neck seam to bottom. The lovely model is a size 6/8 and 5' 11" tall (thank you, Ashley!). This antique coat has been gently cleaned, starched and ironed. It is READY TO WEAR as soon as you receive it. As these coats go, Excellent condition and very well preserved. Often they are very dirty, but this is quite clean with just the most minor spotting. This Edwardian antique motor coat is stunning and with its breathtaking hand spun, hand woven, handmade details, will transport you back in time. Shipping and insurance FREE in the US. International buyers please convo before purchase to discuss shipping. Inside seam is stamped in black ink, "BURLINGHAM". 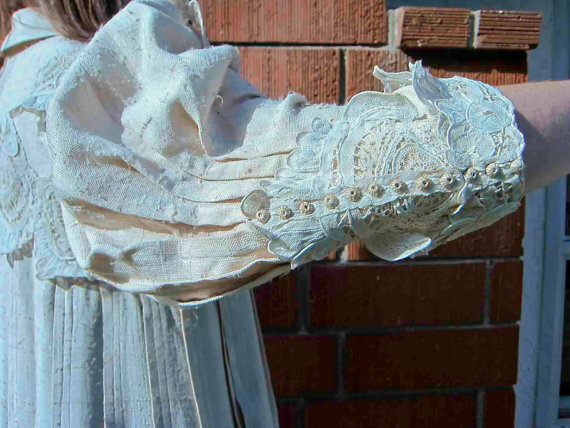 This motor coat is from the estate of Ruth Blood, Salt Lake City, Utah. Due to the antique condition of this motor coat, this is a final sale. First, thank you to the seller for contacting me after finding this blog. (Hi!) This is truly an awesome duster and probably what a lot of the steampunk people are looking for. ;-) I'd put it at around the very late 1890's due to the sleeves.